Google entered the tablet market with its Nexus 7 range last year but it is Amazon, the US retailer that has a somewhat strained relationship with the search giant, that is dominating the Android tablet market worldwide with its Kindle Fire range, a new report claims. Research from mobile app analytics service Localytics which goes live tomorrow shows that the Kindle Fire is by far and away the most owned Android tablet on the planet. The company estimates that the number of Amazon Fire devices in the US alone represents 33 percent of all Android tablets worldwide — while the US itself is the world’s biggest tablet market with a 59 percent market share. 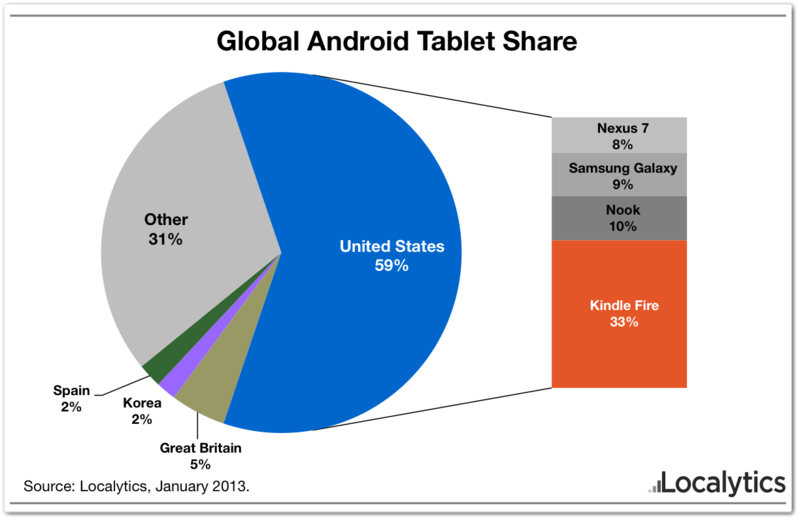 There is a key reason behind that factor, namely the limited availability of the Kindle Fire range itself. Initially available in the US only, Amazon later released its devices in selected European markets but Localytics estimates that 89 percent of Kindle Fires are based in the US. Localytics doesn’t break out device metrics for other tablets but, with US based Kindle devices according for a third of all Android tablets worldwide, it is well ahead of the Nexus 7 (US ownership is 8 percent of the worldwide total), Samsung’s Galaxy range (9 percent) and Barnes and Noble’s Nook (10 percent). Of course, it goes without saying that these are estimates (notably devoid of raw sales or shipments figures) but they present an interesting snapshot of the Android tablet market as it stands today. Localytics says it has “insights into over 500 million unique devices” which have run its analytics and in-app marketing solution. Apple’s iPad has long defined the industry, there’s no doubt in that, but it stands to reason that the broad range of Android partners and devices that they produce will, at some point, eat into Apple’s dominance of the market — as has happened with global smartphone numbers. Likewise, the growing maturity of Google’s Nexus 7 tablets are likely to challenge Amazon. Though initial supply has been limited, consumer demand has been buoyant…though Google lacks the range of devices, width of price points and market maturity of the Kindle Fire. Over time one might expect adoption of Android tablets to grow out of the US, and likewise Amazon’s share of the Android tablet eco-system to lessen as devices from others grow their footprint overseas. However, running counter to that, Amazon is focusing on taking its success global but internationalizing the Kindle. Given that it makes a loss on the sale of devices — content is its real money earner — it has the potential to use aggressive pricing strategies to draw in new and existing tablet owners across the world like few other players can. Indeed, it could be hugely disruptive in China when it finally launches there. Amazon’s app store has already gone live in the country, so it seems like it is only a matter of time before the Kindle, Kindle Fire and others arrive. As it stands today, aside from the US and UK, Localytics says that “no other country has even one percent of worldwide Kindle Fires”. We know that tablet option is at its highest in Western markets, that can be seen as a huge opportunity for growth, or potential for the competition. Enders Analysis analyst Benedict Evans recently looked at what Google stands to gain from Android. While much of the motivation is to help technology reach the hands of new users, Google’s services are baked into the operating system. As it stands, given that Amazon’s own fork of Android cuts out a number of key Google properties — most notable the Google Play app and content store — its continued dominance is lessening the impact of said Google services in Android. In the meantime, any Android developer with a focus on tablets should be distributing their apps in the Amazon App Store. The degree to which Amazon has dominated their most serious geographical market should speak to the future potential, and since Google Play is unavailable on the Kindle Fire family, adding Amazon’s App Store as a distribution channel is important.